Isaac Islas-Cox, a high school junior, is well into his Independent Inquiry studies. In March we introduced the Independent Inquiry program through Kari Wadden’s presentation on feminism and design. I am currently taking part in an Independent Inquiry, in which I get to shape my own educational path; I have been exploring architecture and design by examining a single architectural element and investigating how esthetics, culture and history influence its final shape. One of the goals I incorporated with the help of my supervisors is to “independently enter situations that are unfamiliar or challenging in order to enhance your growth.” To address this goal, I interviewed the founding trio of architects from the firm DesignLINK, Carl Studnicka, Neil Warren and Kawanabe Akihiro. Their wonderful answers and gracious attention to this interview was much more than I expected, and expanded my understanding of the field of architecture. DesignLINK assisted ASIJ to create a master plan for renovating the entire school (a total of 13 plans) in 1997. They have had a hand in the Roppongi campus, the Elementary School doughnut and Multipurpose Room, the High School renovation for earthquake safety, the gym, cafeteria building and the Ricketson Theater. They have also completed projects with several other international schools and airlines. I could tell that these three professionals had developed a comfortable collaborative team when I asked them, “How would you describe your job as an architect?” and they jokingly commented, “Oh, he asked the question.” After deciding who would answer first, Mr. Studnicka commented that in reality, working as an architect is 90% paperwork and 10% designing. Mr. Studnicka added that dealing with clients is a major part of the job because, as an architect, you are responding to and accommodating the clients needs and wishes. The 90% paperwork then consists of meetings with clients to receive their input and creating the program (a document that outlines the plan and the designs for the construction). Many times, he said, designing is the exception, while planning and doing paperwork takes over as the majority. I asked them if their current work was different from what they expected it to be when they were studying architecture. I was surprised with Mr. Studnicka’s abrupt response—“I was dismayed.” He added that dealing with the client’s money takes patience and places the client as the “final decider.” “The architect becomes the solution provider, and really you only have about 5% as your decision for designs and so on.” Mr. Warren contended that it was actually about 10% and said that some projects, like housing projects, offer more design freedom and are a little bit more fun as a result. Up until that point, I had not considered the massive amounts of paperwork that must go with the meticulous designs that the architects construct. I began to realize several other dimensions to architecture: the paperwork, the public relations with the clients, the design process and the construction process. 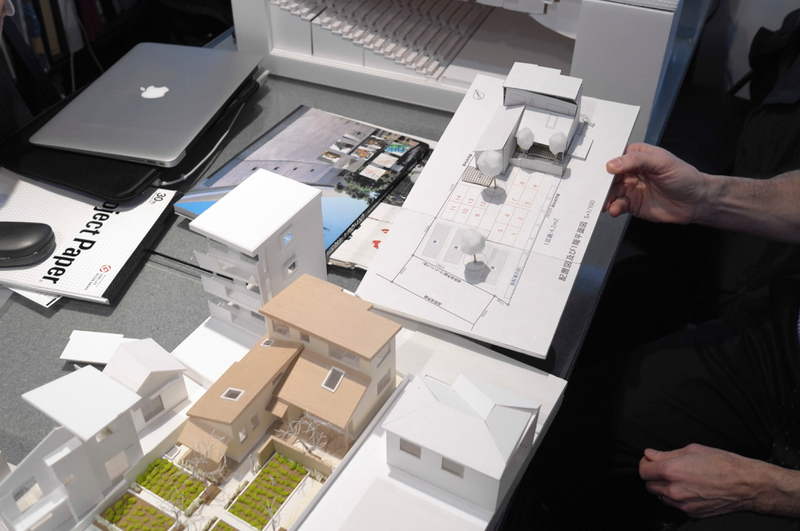 Architects often use a 3D model for the plan made of hard paper, foam and other materials. However, now that there are many computer programs that can generate 3D models. I wondered why architects still use physical 3D models. Mr. Studnicka responded that clients relate much more easily to physical 3D models. 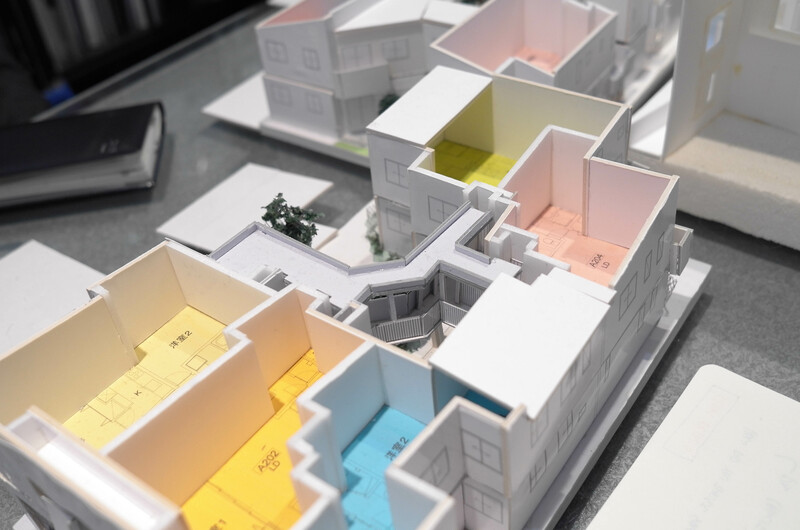 Everyone knows how to touch, while not everyone knows how to navigate a 3D design program, so presenting to clients is much more easy and successful with physical models. Also, for computer generated 3D models to be convincing, they must go through several levels of rendering, which takes time that he would prefer saving by making physical models. For the next step in my Independent Inquiry, I am going to take an element of architecture (in my case, the “door”), research its cultural characteristics throughout history, and extrapolate on the the essence of its design. This will help me to answer the question, “what is good architecture and design?” The research will assist me in creating a new concept for a door or entry into the High School lobby. In addressing my project, I asked the three professionals what is their concept of a door? The three split up in their perspective, as Mr. Kawanabe thinks of a door as something that brings people in, while Mr. Studnicka thinks of a door as a way to keep people out. Mr. Warren considered doors as acting both as a way to bring people in, and a way to keep people out. They all agreed, however, that the environment that the architecture creates should be the tool that brings people in or keeps people out. As a firm with experience in designing lobbies for airline companies, Mr. Warren commented that in a way the lobby becomes the door in some places. What I learned from Mr. Warren is that good design must function, must complete all the requirements and must look good. Mr. Studnicka added that it should be “infused with some spirit too, some kind of character,” and Mr. Kawanabe showed me how he chooses to include nature. He designed a housing compound “like a little village, so that there is security.” He clarified that his idea of security didn’t include guards or special locks, but security in the way that the architecture permits all the residents to know each other, and security that creates a sense of warmth so, although there are no fences, one can sense a difference when entering the compound.